Crystal Lizard is an enemy in Dark Souls 2. 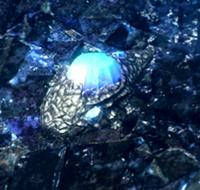 "Crystal Lizards are non-respawning enemies which flee when approached by players. Crystal_Lizard.png When a lizard is nearby, players can hear a distinct jingle sound that resembles shaking a bag full of gems or coins. When killed, lizards drop weapon upgrade items such as Titanite and stones for weapon reinforcement and infusion. If approached, the lizard will scurry away and disappear after about 6 seconds if no damage is taken. If the lizard escapes, resting at a bonfire will respawn it. Lizards do not respawn if killed. If a player kills a lizard but dies without collecting the dropped items, they will disappear. " Near 1st drake: 4 lizards on the drake's plateau, 1 lizard in the tunnel below, 1 lizard on the raised ledge with a crevice in it. Near 2nd drake: 3 lizards scattered along the drake's grounds. Near 3rd drake: 1 lizard on the drake's grounds, 1 lizard on a ledge overseeing them. After the Prowling Magus boss fight, the lizard sits atop a pillar, below the cliff the chapel overlooks. Next to a humanoid spider on the balcony of the home Pate and Creighton fight in. Once approached, the Crystal Lizard will skitter away, even off ledges. The lizards' small statures makes it difficult to hit them using weapons that don't strike downwards. Sniping them using magic or powerful bows that can one-shot them is usually the easiest way to kill them. Note that the items they drop can fall off ledges and therefore be lost permanently. If it's scurrying against a ledge of some kind, just let it go and reset the encounter rather than risk losing the drops for good. Forest of Fallen Giants in SofS have lizard right above sec bone fire in the room where you can brake door.And i didn&apos;t find lizard in the room beside elevator. when I killed one of these blue ones. it still reaspond every three tries. There are some differences for SofS, in harvest valley there are 3 lizards right next to the second bonfire, and no lizard after the artificial undeads. Are almost impossible to hit these *****ed things with. Anyone else ever spotted a red-gemmed lizard? I saw one in brightstone cove, on the far side of the giant conical sand trap, near the rock wall and the magic user enemy.